You may remember our earlier reports on the BBC Micro Bit, the tiny Raspberry Pi-like computer that the corporation is giving away for free to every Year 7 pupil in the UK this year. Unfortunately, those 11 and 12 year-olds are going to have to wait a little bit longer for their bare bones device: manufacturing issues related to the power supply mean it won't arrive until the start of 2016. That power supply had been revised from the initial prototype - it's now an external AA battery pack rather than a coin-shaped lithium battery. The BBC says a "small number" of devices have been having problems. "As a result of our rigorous testing process, we've decided to make some minor revisions to the device - getting it right for children and teachers before we manufacture one million units is our priority," said a Beeb spokesperson. 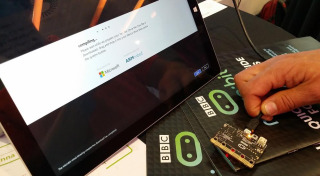 The BBC still seems confident of getting these devices into the hands of school kids in the spring - the move is designed to provoke interest in coding and computer science in the next generation of potential programmers. Despite its diminutive size, the circuit board is 18 times faster than the original BBC Micro computer. It includes two programmable buttons, LED lights and an accelerometer.